Justyne fell in love with Charmer when she worked at Best Friends Sanctuary’s Dogtown. This sweet cutie is a happy boy now in a home filled with love and kindness, but before his rescue he lived his life at the end of a chain. Sadly, many dogs still live this way, but vets, animal science experts and animal behaviorists agree that dogs need to be part of the family. Isolation is a terrible way to treat a pack animal and can lead to negative behaviors like aggression and fearfulness. In addition they are at the mercy of the weather, other animals and cruel humans. Charmer loves people, but he doesn’t do well with other dogs. This could have been caused by the helplessness and lack of socialization that he experienced in his early life. Justyne explains: I fell in love with him when I was his caregiver and I would take him on car rides around the sanctuary. I always knew one day he would come home with me and enjoy his senior years in the comfort of a warm bed and surrounded by my love. Charmer, who is 14, was diagnosed with cancer recently, but that hasn’t slowed him down. He loves his walks and car rides into town, enjoying the sunshine on his face, and the wind in his floppy ears. Charmer is featured on a Christmas card - take a look! 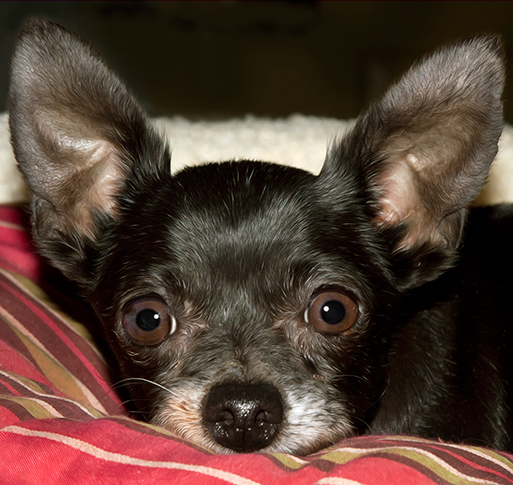 ﻿ Pearl is a sweet and loving Chihuahua who was rescued in 2013 after being abandoned under a bridge in Arkansas, along with many other horribly neglected dogs, simply because they were no longer profitable to the puppy mill where they had spent their lives. She was one of only 3 dogs to survive this ordeal and yet she herself was so sick that her initial rescuers reluctantly considered euthanasia. Luckily, the founder of National Mill Dog Rescue, where she was taken, wanted to give her a chance even though Pearl was about 13 years old, had a severely infected mouth and was very malnourished. Pearl has adapted amazingly well to her fantastic new life. She has a large family of rescued buddies and a mom who takes her to work and everywhere else! Puppy mills can be stopped by educating the public to never buy pets that are sold in pet stores or on the Internet. Breed rescues are a way you can adopt a specific breed and still save a life. Pearl is featured in two cards - here are the links: A Friendship/Keep-in-touch/All Occasion card and a Christmas card.